It’s a new year! How should we make progress in 2018? Riichi Mahjong have many theories that players can learn from to improve their skill. These theories are backed by statistical analysis of large sample size of Mahjong Games played by high-level players. So veteran players had spent a lot of time learning & applying them to improve rather than through trial & error. Where do we learn these from? There are some websites that write these theories in English for the non-japanese riichi players community. Underlined words are all clickable links. 1 important material is Daina Chiba’s Riichi Mahjong guide, it is the only english riichi mahjong book that talk about strategies. There are 2 blogs that have some posts about them like Osamuko and Mahjong.Guide. Many Non-Japanese riichi players discuss in depth about certain what-will-you-discard situations they encounter in tenhou. Actively participating in discussions or at least read about how players support their decision-making process will enable you to learn a lot. I’m quite active there. Highly recommended if you have no discipline to read all the materials but open to ad-hoc discussions. This takes place in Discord, you can enter it through here. There are also other links that I’ve collated at the learners’ corner section if you have not realised! So where do you stand now? Some of you may not have played SMC enough have the rating system reflect accurately of your placing. Different level of players needs to focus on different kind of skills to learn. So below is just my personal guide to how a player should progress in their play ideally. Stage 5 and Stage 4 especially, are quite a grey area in nature and differ in difficulty to different players. Please note that all skills assumed to be done almost optimally. I.e Decreasing shanten for a higher value hand may not be the optimal offensive move. So even if a player thinks he/she is doing that as an offensive, the skill is wrongly applied if it doesn’t yield an optimal move. Stage 6 – To be added 1-2 years later. Wall-Reading. Aim Yaku-nashi Tenpai from turn 10. Reading of pairs/triplets in opponent’s hands. Leverage safe tiles as offence tiles. Melding in consideration of other factors that is not hand-building related. Pre-emptive defence against an impending Riichi. Score distribution based strategies. Incorporate Furiten-Riichi as hand building consideration. 4shanten Sakigiri. Stop players from melding. 3-Shanten Uchimawashi. Bluffing. Good assistance or Sashikomi. Decrease Shanten as an offensive move. Sakigiri at 1-Shanten. Assess risk & benefit differently at Orasu. When to Damaten a cheap hand. Breaking Tenpai & defend. Meld and able to defend whenever needed. 1shanten Uchimawashi. Understand EV with consideration of speed & value & risk. 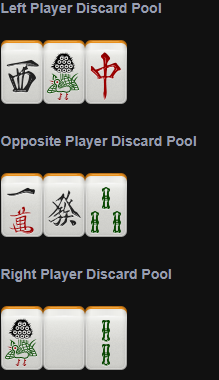 Identify what’s a good/bad hand and able to completely defend against 1 or more Riichi. Understand basic of the timing to Kan. Understand EV with consideration of speed & value. I won’t be going through everything but it serves a good “content page” for me to write more strategies. Feel free to let me know what else I can add into this and what are some strategies you hope to read more about. 1 commonly asked was discard reading that is not listed above because different level of discard reading exists in different stages. But I do have the intention to cover this field bit by bit. I’m going to attempt to try teaching on using safe tiles as offense tiles, something that is difficult to apply and acquire because a wrong application means unnecessary slowing down your hand. If you’re new to Riichi, please read this section for fun. There are more examples than these but will only cover two cases now. The reason why there are hardly any advance strategies written online or books is that it is difficult to prove the things taught to be correct. For example, there are more concrete ways to play a tenpai hand as compared to a 5 shanten hand. The permutation and combination of the results made by a discard at high shanten hand are a lot more. In the near future, I would be challenging myself to impart this knowledge as smoothly as possible to the Singapore Riichi Mahjong community. For now, I just want to show a preview of how in-depth and counter-intuitive Riichi Mahjong can be. You are East. South 3. Dora is 6s. Stage 1-3 players most likely will choose to discard chun here. It is easier to pon ton if it pairs up since nobody else will need ton. Stage 0 players might discard 4m, focusing on making chanta. Stage 4 players, with 3-4 shanten sakigiri skill might choose to discard 3p, looking at chanta. However, a 3-4shanten sakigiri skill application is meant for strengthening defense while aiming for bigger hand because your hand is weak anyway. This 3p discard is not based on sakigiri. It is your last oya, and you definitely hope to win this hand. This hand is not bad with 3 ryanmen but not very good either because of the shanpon 9p pei. Chanta reasoning is weak when there is a 4m and dora is 6s. Even if is not 4m but 3m, chanta should not be aimed. A discard made here should be reasoned based on offense/maximal speed reasoning. Is 3p still the fastest discard? The recommended answer is indeed 3p but the reasoning is that it gives you the fastest and most flexible way to win this hand. There are two questions you must always ask yourself when you look at your starting hand; 1. Is this a winnable hand? Maybe 2. Should this hand aim for Riichi or not? Unless 9p or pei becomes ankou, this hand is not easy to reach menzen tenpai. It is pretty much confirmed that you will be fixing 78m, 23p and 78s as your 3 sequence sets to be formed. The problem is getting something to replace the pair of 9p or pei as the 4th set. So we have to discard 1 out from 4m, 3p, chun or ton. Let’s first analyse the pros & cons of keeping 3p. Having the 3p means you might form a triplet after drawing 3p but that actually make your hand WORSE! Your hand will lose its pinfu potential and you have committed to a riichi hand if your chun or ton fail to pair up. So drawing in the 3rd 3p is NOT a backfire. What about forming an extra sequence? Indeed, forming a sequence with a lone 3p is better than trying to form a triplet of ton. However in this case, even upon drawing in 14p, it forms your first sequence first. This is known as overlapping tile efficiency, where 2 or more of your sets need the same tile to form the set and therefore it is better to avoid it to minimise backfire of drawing in other kinds of tiles. What about 7pairs? 7pairs should be ignored here as you have many tiles that are difficult to pair up in nature, like 7s 7m and 4m. As you can now see, the benefit of keeping that 3p is rather minimal, as compared to drawing in a 2nd ton. If your chun or ton gets paired up, its pretty much set that the fastest way to win this hand is to pon the yakuhai! So you can discard 4m here as you no longer need it for pinfu. Chun is kept if it gets pair up again, your hand value will increase by discarding 9p. Currently, the hand is still cheap, how should you offense in the way that you don’t get yourself into trouble? Firstly, you need to meld your ton, if you can’t, you can meld 6m, 4p and 6s. Do not meld pei, 9m, 1p, 9p and 9s. This makes ton harder to be discarded. 9s is most taboo because you have cheapen-ed your hand by rejecting the acceptance of dora. Pei is also taboo because you need it as defense if needed, after you pon your ton. Should you pon the 2nd copy of pei or 9p? Otherwise they will be no more left! The answer is No. In fact, that makes things better. Let’s say pei is dead. One 9p is discarded, you drew a hatsu. 9p is now hell wait. Rather than expecting this hell wait, its better to expect drawing in chun or hatsu. Therefore, discard 9p here. Again, the holding of this chun and hatsu are offensive moves. So why is it better if pei is dead? That’s because you can now safely Atozuke (winning on ton). With a pair of pei that are definitely safe, you can now meld in peace. If you manage to pon ton first, your 14p will be discarded rather quickly for you to chi, because your first discard being 3p will definitely make your opponent think that 1p at least, is safe to you. So along the way, as you meld, you discard a relatively safer tile, chun or hatsu if they don’t pair up. Defend with pei if someone riichi, followed by ton. So this hand basically becomes rather safe to play with, at the same time easy to go offence. In summary, all the honor tiles here were used in some form of offence. 1. Consider ton/chun to be paired up. 2. Consider hatsu to add additional value. 2. Using pei as pair (to never pon it). Yet at the same time, all these can be used as safe tiles! That was what the theme meant by using your safe tiles as offence tiles. Intermediate players tend to think that sakigiri and keeping safe tiles are defensive move and decrease tile efficiency. This is not true all the time. The discard of 3p enables you to chi 14p easily as the game progresses, this speed up your melded hand should you have decided to meld, keeping the option of opening your hand to win via yakuhai. Advance players should learn how to apply these skills as offensive moves as shown above. Please note that this theme is targeted at intermediate players (stage 3-4 players). Based on the theme, I believe everyone would have guessed that the recommended answer is discarding 1p. This is definitely not the fastest way to Tenpai. The fastest way is discarding 1s because one 2s is already out and there are also few tiles left to pair up 1s3s. The discard made is here to strike a balance between offense and defense. This is a hand if you would to force keep honour tiles as safe tile, you will lose a lot of speed. It is still an awkward hand because you have no idea whether you can win or not. It’s weak but with some good draws, it is a Tanyao Sanshoku hand. All these criteria should be satisfied and used as a benchmark to gauge the extent you should hold safe tiles. For example, if this is turn 7, even if there are 2 2s are discarded, the recommended answer will still be 1p. Another example of 1st criteria not met, is having 799m instead of 688m at turn 4. Then the recommended answer is 1p or 9m even if two 2s are out. This case study is pretty much right in between a decent hand and useless hand. Learning how to defense while keeping the option to offense is an important balance to achieve while playing this kind of hand. Disclaimer: There is no concrete evidence that the above write-up is definitely correct. It is possible that the case studies used are not the best illustration and hence might be disagreed amongst players who have the similar level of skill as me. However, the concept or thought processes are definitely relevant and serve as a good reference.